In which The Gay Recluse says great, wtf. We’ve written before about the vacant house next door, which we’ve been complaining about for close to umm, 10 years. But finally last spring it was declared unsafe, which may mean 1) the city is going to knock it down, or 2) some developer bought it and is going to renovate so that the city won’t force him to knock it down. Who knows? The good news is that a construction crew showed up the other day and put up scaffolding. 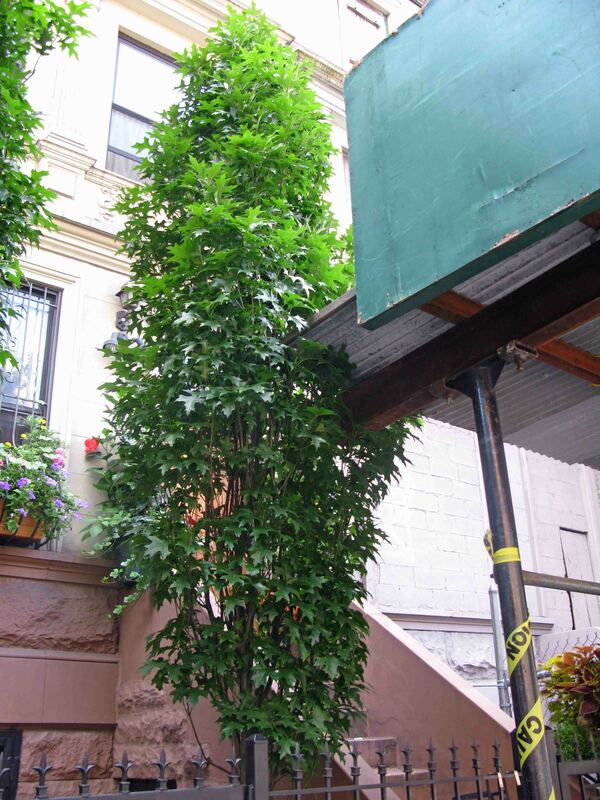 Thank you, geniuses, for extending your scaffolding all the way over our stoop (without even asking) and putting it directly into the columnar pin oak! We’ve heard that’s really good for trees, especially if you leave the scaffolding up for a few years. File under: be careful what you ask for, especially when the city’s involved. Ith’s not a good idea to burn bridges, but this is one sidewalk bridge that needs to be burned down.